Digital Marketing, Entrepreneurship, Startup Culture and Fitness. Welcome to Part 1 of our 5-part series on applied psychology as a method of approaching outreach for link building and inbound marketing. In this first part, I’m going to talk about the principle of reciprocity, what it is, and how to use it in your outreach efforts. By now, I think most people, who are involved with outreach for a living, recognize that reciprocity is an extremely important part of the equation. Put simply, reciprocity is give and take. You give something; you get something in return. That might sound straightforward, but there’s more going on under the surface. Let’s take a look at the psychology under the hood, as well as some example emails. Why Do Some People Reciprocate When Others Don’t? Those of us who have been involved in this industry for some time already know that the last thing we want our email to do is ask for something without promising anything in return. So why is it that sometimes the people we contact reciprocate, whereas other times they simply do not? In 2014, Doctor Jin-Soo Lee and his colleagues decided to investigate how relationship marketing and reciprocity worked together. The central question: what makes customers reciprocate kindness on behalf of a brand? To answer that question, they surveyed customers of an upscale restaurant, specifically those who had a membership card and got relational benefits, as a result. What they found was that the special treatment that they got because of their membership card did not play a significant part, at least not one they could detect with their sample size. Instead, they found that providing social benefits and instilling confidence were the factors that led to results. Why? On a more fundamental level, here is what they found. Satisfaction didn’t lead to their customers reciprocating. Instead, they discovered something very different. It was gratitude that led to positive reciprocation. The implications of this for relationship marketing would be hard to overstate. Put simply, a reciprocal, mutually beneficial relationship, even the one that benefits both parties financially, is apparently not found in financial underpinnings. Instead, these relationships grow from highly emotional roots. When you shift focus and start realizing that this isn’t really about satisfaction, but about something much more personal, thankfulness, it should have a very dramatic effect on the way that you approach your outreach. As I said, this experiment was looking at relationships between an upscale restaurant and their premium members. Is it fair to generalize those results to the relationships between influencers on the web? I, for once, absolutely believe that they do. It seems obvious in retrospect, doesn’t it? How could it be anything but gratitude that drives a mutually beneficial relationship in your outreach efforts? But as obvious as it might seem, looking back on it, we clearly don’t always realize that this is the foundation we should be seeking. Instead, all too often we find ourselves going out of our way to impress, to prove that working together will make us both money, or even to find some trick that will just get them to pay attention to what we have to say. All of the above has its place, but gratitude is a central ingredient. Take a look at this email. Suppose you were receiving it from somebody, out of the blue. Subject: Can you trade links with me [name]? Hello [name], my name is [name] and I was wondering if you would be interested in trading links with me. I am [credentials] who blogs about [topic]. Search engines base their rankings on how many high quality links are pointing at them from other sites on the web. If we both link to each other it will improve our search engine rankings. Please let me know if you would be interested in trading links. If you’re like most people, you will be immediately repulsed by this email. The fact that trading links with this person might improve your rankings probably doesn’t mean very much to you, even if you’re knowledgeable about SEO, because the way they are talking to you is so blatantly self-serving, even if they’re being clear with you about how it will benefit you. You don’t trust this person because they really haven’t done anything for you, and you’re probably wondering if trading links with them is some kind of scam, if you’re going to get penalized by Google, or if some other unanticipated shady thing might happen. Yet, this is exactly the kind of email somebody might send if they had the wrong idea about reciprocity. The text makes it clear that both of you will benefit, so why shouldn’t you go along with them? Simple. Because you have nothing to be grateful for. This is an email from a stranger, who is trying to get what he wants, and the promise of something in return strikes you as shady, even though you could always just remove your outbound link, even though it would take you maybe five minutes at most to set up the link. It just doesn’t sit right with you. Now imagine you’re receiving this email instead. Hi [name], I came across your post about [topic] the other day and thought it was great. I’ve always found it interesting how [elaboration] and when you brought up how [elaboration] it really clicked with me. I hope you don’t mind that I quoted you on this in this post: [link]. Would you be interested in letting me interview you? If so, let me know. Now what is your response? At worst, you might respond by saying, “Thanks, that’s great. I’m actually too busy right now for an interview but I really appreciate you reaching out to me.” In contrast, you likely wouldn’t have even responded to the previous email. I’m not going to tell you that everybody you contact with an email like this, is going to respond by enthusiastically saying that, yes, they are interested in an interview, and would love to link to it after it is posted. But, you could immediately feel the difference reading this email, couldn’t you? Even if it is transparent to you that this email is, in part, self-serving, it no longer matters in nearly the same way that it did in the previous email. The research above explains why. It’s because this email gives you a reason to express gratitude. Responding with anything less than “thanks” feels rude, and you probably feel compelled to do more, especially if what is being offered is mutually beneficial for you. So, if you want to get responses from your emails, start by thinking of things you can do that will result in gratitude. It doesn’t always have to be mentioning them in a blog post. Be creative, strategic, and genuinely helpful. Personally, I have received plenty of emails like the first one that immediately go in trash bin, without even sending a response. 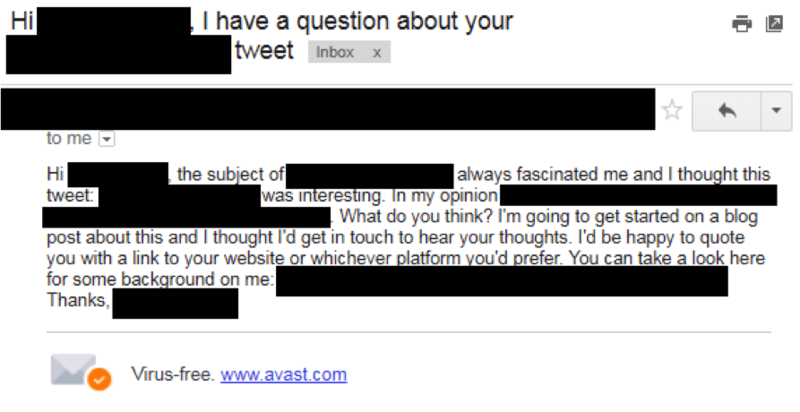 I have received very few emails like the second one, but I doubt I have ever received one that I didn’t respond to. And I’ve certainly found that when we send emails more like the second one, we are much more likely to get a response and a jumping off point for a mutually beneficial project. So is that all there is to it, then? Well, no. I’d like to share one thing in particular that is another crucial ingredient, utterly necessary for reciprocity to work to its fullest potential. In 2009, Professor Ya-Ru Chen and her colleagues ran two experiments to find out when reciprocity was weak, and when it was strong. In one of the experiments, 116 MBA students were asked to imagine a scenario. They worked together with somebody on a project, and both of them put in a similar amount of effort. They would be rewarded $1,000 for their work, but here’s the catch. Their partner would determine how much they got. Then, half the students were told that their partner would only give them $200, while the other half were told that their partner would give them $800. If they refused, they were told, all $1000 would be returned and they would get nothing. If they were asked to imagine that the colleague was a close friend, 62% were willing to accept the $200 deal. But, if they were asked to imagine that they were a stranger, only 20% were willing to take the $200. This tells us two important things. First, people are willing to sacrifice any benefit at all in order to punish somebody for an unfair deal. More importantly, we are far more willing to accept an unfair deal from somebody that we see as a friend. What’s the lesson? Long-term relationships matter. We’re willing to accept a relatively unfair deal from a friend because we expect them to reciprocate later. We don’t accept the same from somebody we hardly know, because we don’t expect any reciprocation later on. So, while gratitude is crucial, it may not be enough if there is no implication of a long-term relationship. If you want your outreach efforts to be successful, it’s important to go in with the goal of creating lasting partnerships, or you may find that people simply aren’t willing to offer you very much. Here’s an example of a relationship-building attempt that is…well…likely to fail. Hi [name]. I would like to work together with you on projects and start a business relationship. I believe it would be mutually beneficial for both of us. Would you like to work together on a project with me? Now, this is a particularly egregious example, but believe it or not I have received emails like this, and if you’ve been in the business long enough, you too probably have. The most obvious thing that’s wrong with this email is the fact that it doesn’t really mention what we’re going to be working on together. It doesn’t tell me why this person is interested in contacting me specifically, or what they can offer to me. What’s less obvious, but at the root of what makes emails like this fail, is that this email seems to miss the point of building a business relationship. They seem to understand that a business relationship would be mutually beneficial for us (they say it outright), but nothing they say indicates what that mutual benefit would look like. More to the point, there’s no indication that there’s any reason we would be compatible for a business relationship. The sender seems to think that more business contacts is always better, regardless of compatibility, regardless of what kind of project we might work together on. So, the first obvious thing here is that the email gets a great deal more specific, but without a scary wall of text that will waste my time. It’s clear that the sender knows who I am, it’s clear that they had a specific reason for reaching out to me, and they’ve given me a brief glimpse into who they are with an opinion and a link for some more info if I’m interested. Perhaps the most important thing here is the fact that they ask me a question other than “would you like to work on a project with me?” I’m not even saying the difference is that they got specific about the project, either. What is more striking a difference is that they are asking me for my opinion. By sharing their own opinion and asking me for mine, they are demonstrating that they understand more about the value of business relationships than the first email. In fact, this difference is so dramatic that I have happily responded to emails that did literally nothing else. Just a subject line and a one sentence email with a question. I’ve also found that this has been the most effective way for me to reach out to people in a way that will lead to a lasting business relationship. Of course, I’m not necessarily talking about more format oriented contacts, such as reaching out to a publication with a blog post. Those platforms tend to have a specific format they expect from emails. I’m talking, instead, about more open-ended business relationships that lead to unexpected collaborative projects. These are the kinds of business relationships that keep delivering, because you’re never quite sure what unique and interesting way you will find to collaborate in the future, but it will always result in traffic and links, if not other business opportunities. I’m not claiming that you should approach these emails like a first date, or push the “will you be my friend?” angle too hard. These things can certainly backfire, and we need to remember that emails of this kind should always be ostensibly about business-related projects. There’s something creepy and unnatural about trying to make friends with people explicitly to achieve success in business, and it typically doesn’t work. What does work, however, is using business opportunities as a way to get to know people. How well you get to know them and how close you become outside of business circles is something that should evolve naturally, of course. In short, look for a way to make your outreach more “business casual,” drawing the line between business opportunities and connecting with people on a more personal level. In part 1 of our 5 part series “How to Use Psychology to Enhance Outreach,” we discussed the first psychological principle of outreach: Reciprocation. I would argue that it is the most fundamentally important principle of outreach. When you are contacting somebody with the goal of advancing your business, you will fail if the person you are contacting doesn’t see anything in it for themselves. But, in evaluating the psychology behind this principle, we found that there is more to it than solely the mutual financial benefit that comes from collaboration. Reciprocity is very much based in emotions, no matter how rational we try to be in the business community. The two most important factors necessary to make reciprocity work are: gratitude and relationships. I found that people are more receptive and committed to reciprocity if they feel gratitude toward the other party. This is true even for something as ostensibly impersonal as VIP membership with a restaurant, where one would expect that perks would be the only motivating factor. We also explored the fact that relationships are crucial to making the most of reciprocity. People evaluate deals and financial exchanges with strangers differently than they do with friends. Business relationships are similar. The more familiar you become with somebody, the less skeptical you become of the deal you are offered, and the less friction you will have in your collaboration. Take me to part 2. Pratik Dholakiya is the founder of The 20 Media, an SEO and content marketing agency, and advisor at MoveoApps, a mobile apps development company. 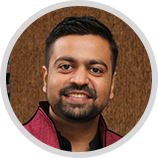 Pratik has contributed on sites like Moz, Fast Company, Social Media Examiner, KISSmetrics, and Content Marketing Institute to name a few. He's a "must-follow" SEO expert according to Search Engine Watch and has been named one of the top content marketing influencers by Onalytica. He's passionate about fitness, entrepreneurship, start-ups, and all things digital marketing. Hit him up on Twitter @DholakiyaPratik for a quick chat on any of these topics. Don't have time to check my blog on a regular basis? Subscribe now and get the latest posts delivered to your inbox.